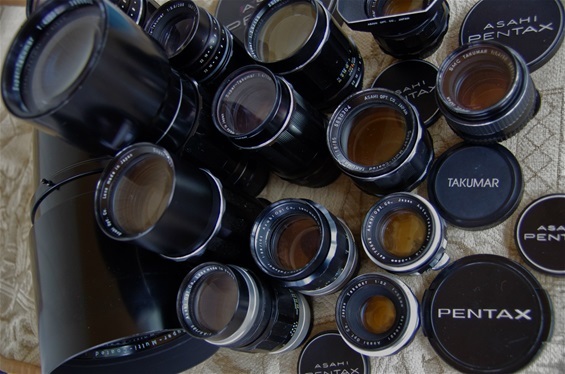 When starting producing the Asahiflex waist level slr cameras in 1951, Asahi Optical named the new lenses Takumar. This name was to be worldknown as high quality lenses through the M 37 and, above all, the M 42 screw mount period, lasting till the K mount was introduced in 1975. From then on the lenses got the same name as the cameras: Pentax. Takumar, Macro-Takumar, Tele-Takumar, Auto-Takumar, Super-Takumar, S-M-C Takumar and SMC Takumar lenses came in many versions from 17mm to 1000 mm. In my collection at the moment are some 60 lenses from 20mm to 500 mm.